The Joker has been blessed. Yes, I know, you might be thinking it is about time. Perhaps you are surprised. I think he was surprised himself, to be truthful. But there you go. 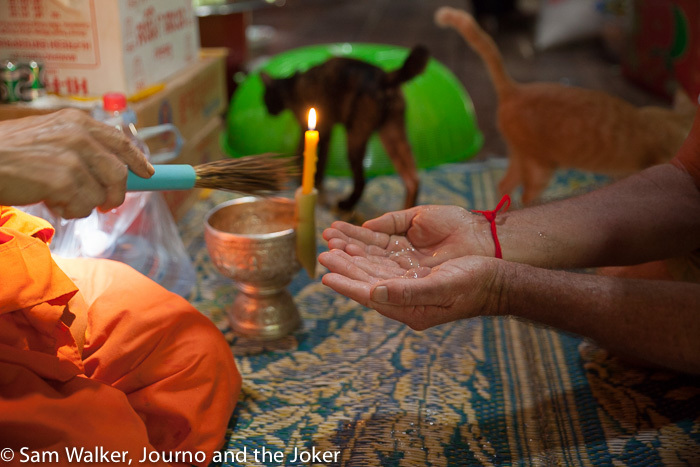 He has received a blessing for peace and happiness and good luck. There was also some mention about a king but I don’t think we should dwell on that too much. 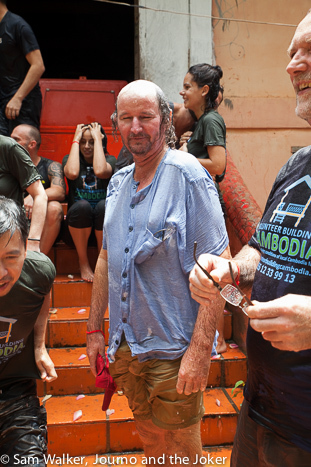 It was a Buddhist water blessing – apparently quite common here in Cambodia, although I’m not sure about other Buddhist countries. The ceremony is performed at a pagoda by a monk, for a small fee. 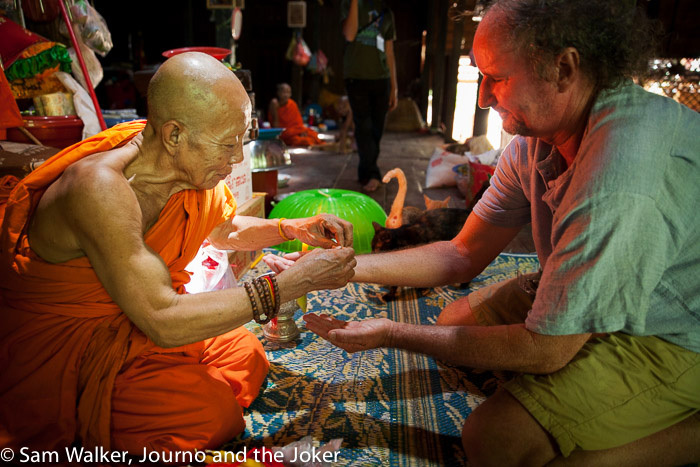 It started with an individual blessing from the monk. This monk is apparently the most senior monk at the pagoda. After saying some words for a happy life he tied a red string around each individual’s wrist. Monks do not touch women so someone else must tie them for women. Then some water is brushed onto the hands, which you then put over your face and head. 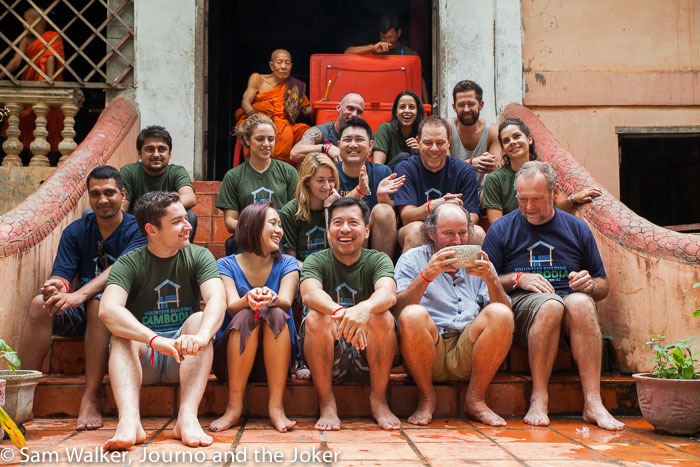 The Joker took part in this ceremony with a group of volunteers, who funded and helped build a house in a village outside of Siem Reap for the NGO, Volunteer Building Cambodia. 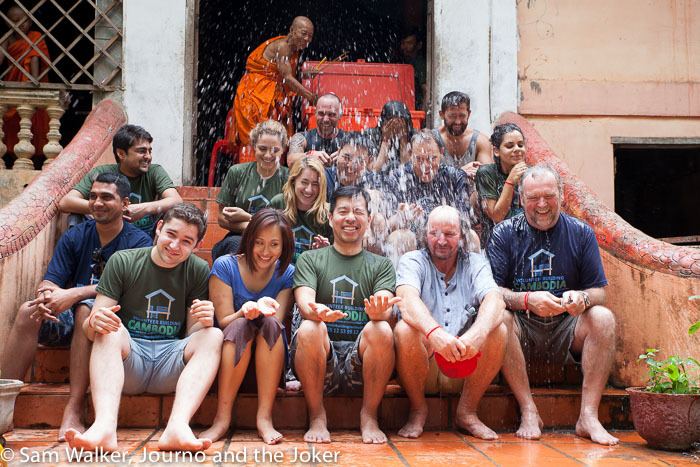 After the individual blessing, it was time for the water blessing, which was a group affair on the steps of the pagoda. A bowl was passed around with participants supposed to drink from it or put their lips to it. The Joker strategically placed himself in the front row to avoid a drenching. 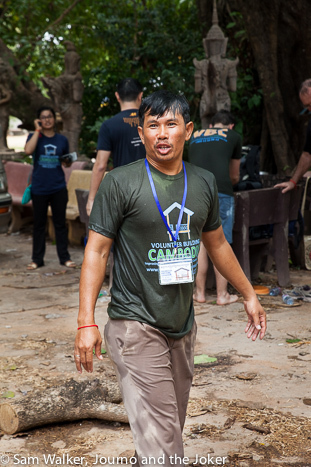 He was well and truly drenched, along with everyone there. And the boss thought he was going to slip away nice and dry but the crew had news for him. It wasn’t long before they made sure he was soaked as well. It looks like a lot of fun and a bit of a lark, but it is a serious ceremony for practicing buddhists who visit the pagoda and receive the blessing when they feel the need for a spiritual boost. So the Joker is now blessed with wishes for a good future but I think he is still some way off becoming a king. Thanks Nic! Appreciate the feedback. I didn’t like the fact that the monks are not allowed to touch women. Why, there must be a story there. From what I can understand, Buddhist nuns will also not touch a man. I have read various explanations but not sure which is correct. The one that keeps cropping up is that monks rarely touch another because they don’t want to take on the energy of another person, but in particular a woman’s energy is seemed as distracting. Yes, it sounds a little sexist but I haven’t yet gone to the source to get clarification on this. I will endeavour to find out. And we are happy that you can travel vicariously through us.